Now that we are in the fall season, I am in full sparkle mode. I received this gorgeous necklace and nail laquers from my friend Alicia of Word of Alicia who is also in love with all things black and gold. I can now conquer the holiday season feeling just that more special. Statement necklaces really help dress up an outfit. Even the most basic white cotton tea would look amazing with this Go for Baroque Necklace from Avon. Yes, people Avon. 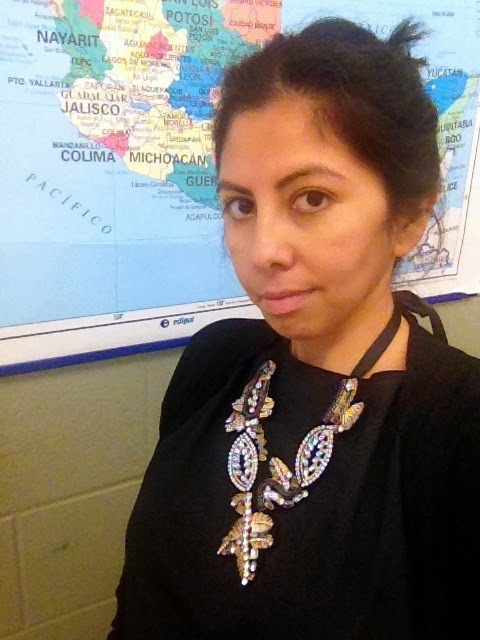 Sure I'm just a little old Spanish teacher but I love fashion and everyday is an opportunity to express yourself either en español or in fashion! I had to do a cheesy selfie because my photographer is away on business but you get the idea. This necklace is magical!! Are you on the bootie bandwagon? I don't know if it is living in Nashville or what, but I have acquired a few pairs of boots over the past year. Maybe it was foreshadowing that I would move to Nashville, either way I love them, especially since the temps are falling and they are a little more cozy than heels. It's Black and Gold for me lately what about you?